In 1940, the US population was about 131 million, 12.6 million of which was African American, or about 10 percent of the total population. During World War II, the Army had become the nation’s largest minority employer. 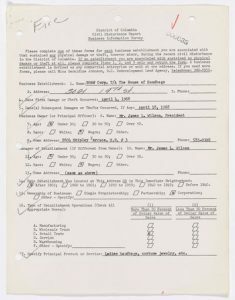 Of the 2.5 million African Americans males who registered for the draft through December 31, 1945, more than one million were inducted into the armed forces. Along with thousands of black women, these inductees served in all branches of service and in all Theaters of Operations during World War II. During World War II, President Roosevelt had responded to complaints about discrimination at home against African Americans by issuing Executive Order 8802 in June 1941, directing that blacks be accepted into job-training programs in defense plants, forbidding discrimination by defense contractors, and establishing a Fair Employment Practices Commission (FEPC). After the war, President Harry S. Truman faced a multitude of problems and allowed Congress to terminate the FEPC. 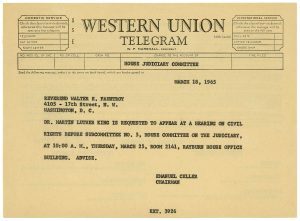 However, in December 1946, Truman appointed a distinguished panel to serve as the President’s Commission on Civil Rights, which recommended “more adequate means and procedures for the protection of the civil rights of the people of the United States.” When the commission issued its report, “To Secure These Rights,” in October 1947, among its proposals were anti-lynching and anti-poll tax laws, a permanent FEPC, and strengthening the civil rights division of the Department of Justice. 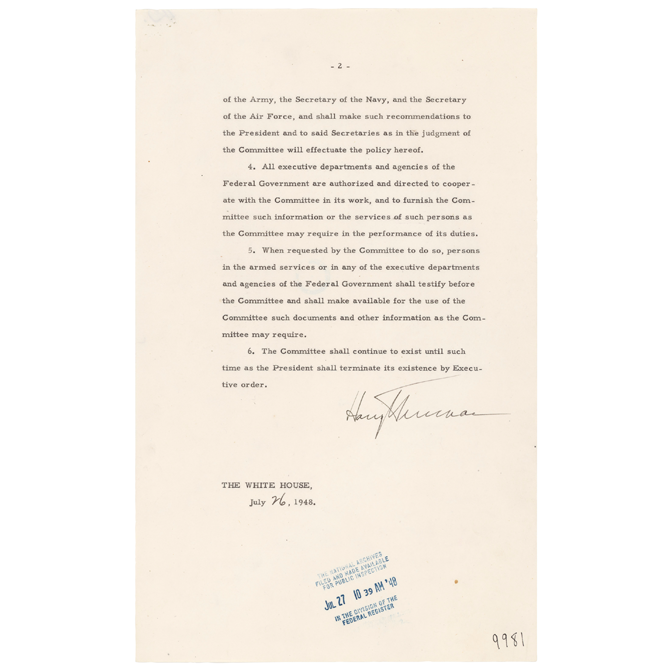 In February 1948, President Truman called on Congress to enact all of these recommendations. When Southern Senators immediately threatened a filibuster, Truman moved ahead on civil rights by using his executive powers. 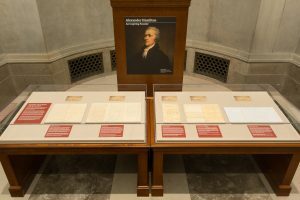 Among other things, Truman bolstered the civil rights division, appointed the first African American judge to the Federal bench, named several other African Americans to high-ranking administration positions, and most important, on July 26, 1948, he issued an executive order abolishing segregation in the armed forces and ordering full integration of all the services. 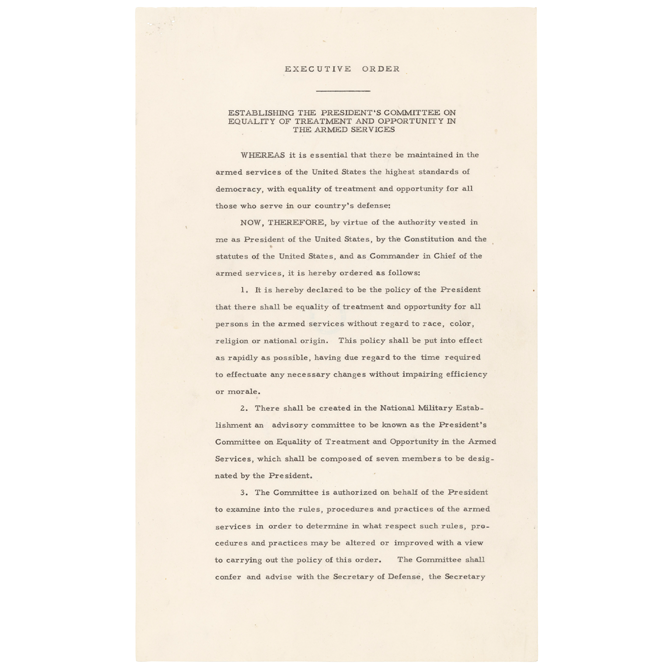 Executive Order 9981 stated that “there shall be equality of treatment and opportunity for all persons in the armed forces without regard to race, color, religion, or national origin.” The order also established an advisory committee to examine the rules, practices, and procedures of the armed services and recommend ways to make desegregation a reality. 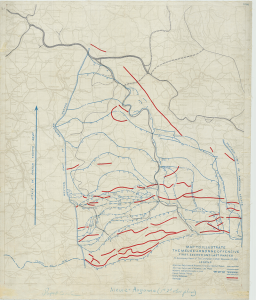 There was considerable resistance to the executive order from the military, but by the end of the Korean conflict, almost all the military was integrated.